Looking back to last year, 2009 was filled with a roller-coaster of events relating to the coin collecting world. Among the many highlights, new coin releases such as the Abraham Lincoln Commemorative Silver Dollar and the four redesigned 2009 Lincoln Cents are sure to be recalled by anyone even slightly familiar with the hobby. The sharp US Mint June coin production increases may further jog the memory, reminding collectors of the historically low mintage levels in 2009. For the entire year, just 3,548,000,000 circulating coins were produced. In comparison, 2008 had a production total of more than 10.1 billion and 2007 came in even higher over 14.4 billion. In fact, the last time the US Mint had circulating strikes at such a low level was forty-plus years ago. With the 2009 coin production standing at a mere 34.98% of the previous year, it beckons one to research the numbers a bit further. In doing so, and as has been pointed out before on CoinNews, the coins experiencing the biggest production losses were 2009 Roosevelt Dimes and 2009 Jefferson Nickels. Both were only produced in the first half of 2009. The U.S. Mint announced in April of that year that it would not strike any more. That left the total production of dimes at 146 million, or a mere 13.9% of the 2008 figures. 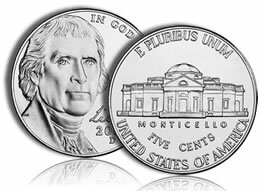 The nickels fared even worse as they dropped to 13.53% of the previous year’s production, or 86.64 million coins. Their relative scarcity compared to past years has driven their values higher in the secondary market. Looking at the online auction site eBay, over one thousand auctions have been seen in the last ninety days alone offering a single roll of 2009 Roosevelt dimes. The average price paid for each $5 roll was $12.60. Rolls containing Philadelphia minted dimes averaged slightly under, at $10.89. 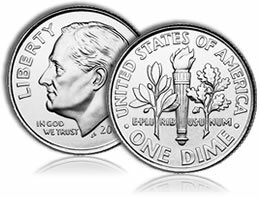 Denver minted dimes commanded the highest premiums with rolls sold at an average price of $13.61. That discrepancy is understandable as the Denver Mint only struck 49.5 million dimes compared to the Philadelphia Mint’s 96.5 million. While an average 152% premium per roll is handsome, it is nothing compared to the prices paid by some anxious buyers. Several auctions, while anomalies, closed with buyers shelling out around $50 for a single roll — with little regard to Denver or Philadelphia rolls. Glancing at graded dimes, the top MS69 2009-P dimes are commanding $200. Lesser grades like MS66s drop down toward the $16 range. By far, the big daddy was one auction for a MS69 2009-D dime that closed above $850. Turning to rolls of 2009 Jefferson nickels during that same time frame but with well over 2,000 listings, the average price paid on a single $2 roll was $20.06. For those interested in the math, that equates to an average 903% premium. If that brings excitement, many sellers received well over $100 for a single roll. Graded individual nickels were fewer and farther between, but those appearing on eBay did quite well. The top price paid was $175 for a MS66 2009-P nickel. A MS65 2009-D nickel was close behind at $150. Time will tell if the values on these coins maintain. Learning that the 2010 nickel and dime mintage levels are much higher than those from 2009 should help. I received so far 3 2009 D nickels in my change & 1 2009 D dime here in the Los Angeles Metro Area. I got one 2009-P nickel last year late in November. I haven’t seen another since. 2009-P dimes started appearing around June of that year (still waiting on a 2009-D). I have yet to see any 2009-D nor any 2010 dated nickels but 2010-P dimes have been showing up in some numbers. 2010 cents have appeared but remain infrequent (as is still the case with 2009 dated cents). I have yet to see any 2010 quarters and 2009 dated ones are also appearing infrequently. I have yet to find a single 2009 dime or nickel in change and I’ve had to pay ridiculous prices for the ones that I have. I received a 2009D dime in my change on May 1st of this year. It was the first one I’d seen in circulation. I got it in my change going out to dinner after purchasing a new car. I considered it a good omen. Still waiting on finding 2009 nickels. I have received 4 2010D dimes so far, so Denver must be cranking them out. I found at my work a 2009 nickel that is printed upside down does anyone know if this is worth anything?